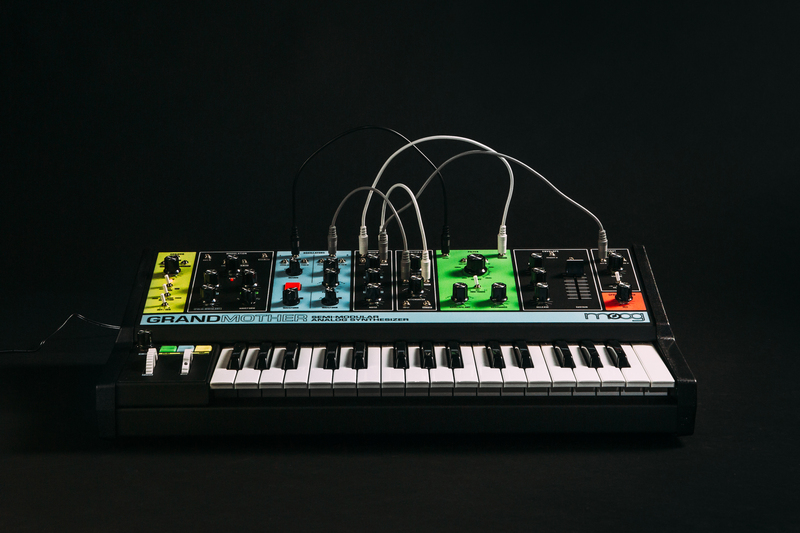 With the tabletop Mother-32 and DFAM semi-modular units, as well as the 40-unit-only reissue of the IIIp vintage system, Moog re-entered the modular synthesis arena. While the Mother-32 and DFAM are affordable and accessible pieces kit, they lacked a keyboard. And the IIIp's limited-edition run and correspondingly high price meant vintage circuits would remain out of the hands of average musicians and producers. But the Grandmother, released by Moog in May last year, is an inspired attempt to bridge these divides. 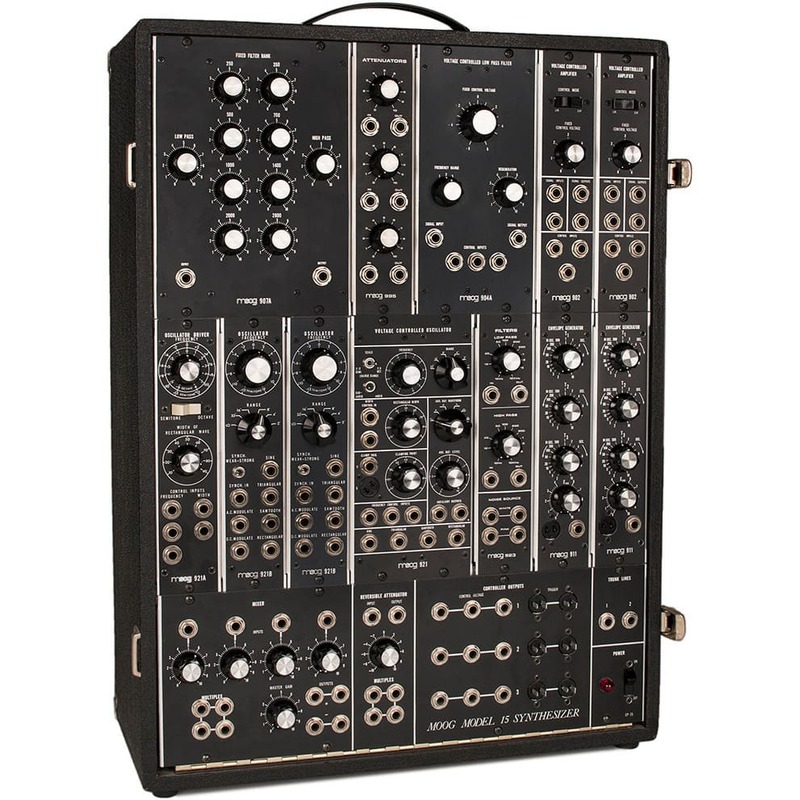 It gives players a semi-modular synth with a keyboard, but also the vintage circuit of Moog's iconic modular systems. Because it is semi-modular—coming with preset sounds and internal patches—the Grandmother can be played and tweaked without patching circuits. But for those who want more complex and programmable sound options, players can patch the Grandmother's separate modules, which are arranged rather like Eurorack modules, or connect them to external modular gear. Whatever one's approach, the Grandmother is incredibly musical and colorful, with a sound that differs markedly from Moog's other offerings, like the Mother-32, Sub 37, and related gear. Trent Thompson, product marketing manager at Moog Music, tells Reverb that the Moog Rogue and MG-1 were also big influences on the Grandmother. Moog aspired to create a semi-modular keyboard synthesizer that was as fun and easy-to-use as those other synths. The Moog Sonic Six, with its memorable blue color, also inspired the Grandmother's blue modules, though it also has yellow, green, red, and black ones as well. "We wanted people to look at it and feel like they could have fun with it, because so often people see a synthesizer and feel like it's not for them," says Thompson. "We wanted something that was fun and looked fun, but could still be really deep." And deep it is. Amos Gaynes, a product development specialist and a lead engineer at Moog Music, says the depth grew out of a desire to combine the semi-modularity of the Mother ecosystem of instruments with the vintage modular circuits. As you can read below, he also shared many more thoughts on the making of the Grandmother. "A lot of the younger generation of people here at Moog had never had hands-on experience with the full vintage systems, just because they weren't around," says Gaynes. "So there was a real revelation in the vintage systems of what it sounds like to work with those high-voltage, full-bandwidth circuits that are very simple, straightforward, and direct. The clarity and power of the sound that you get out of them, and the sort of limitless depth of the modulation—there is something about those circuits that is special and justifiably famous." The one-on-on, hands-on experience with the vintage systems, according to Gaynes, opened Moog's eyes to what the magic was in those circuits. Moog wanted to, in effect, bring these modular circuits to the masses. "We wanted to find an instrument that would tie these worlds together, bring modular circuits to more people, and create a really fun hands-on playing experience even for people who weren't trying to tie into a modular system," Gaynes explains. "But if they were, then it was giving them the best of the vintage circuits with full connectivity to a modern system in a really fun, accessible, inspiring, and friendly little package." As Gaynes explains, the Grandmother's oscillators are sawtooth core with four waveshapes. The modulation oscillator is identical to this oscillator, just with different waveshapes and a lower frequency range. "The saw, pulse, and square are derived in exactly the same way as the Mother-32 oscillator," says Gaynes. "The triangle is derived using a wave-folder on the sawtooth, and the sine [on the modutional module], with a wave-shaper on the triangle—the same way they were done in the 921 oscillator module." The rest of the instrument—particularly its filter, but also the spring reverb module—is mostly based off of the large format modular synthesizers. The only difference is that these vintage-inspired modules feature modern circuits that Gaynes says allows them to "play nice and survive in the standardless world of Eurorack." In the Grandmother's research and development phase, Moog went through the Model 15 piece-by-piece to find out how each component and sub-circuit contributed to the sound of the instrument. They only added to or changed the circuit where they felt it was necessary, useful, or fun, without of course affecting the sound of the legacy modules (the CP3 904A, 902, 911, and 905). The Grandmother's instant musicality is intentional, and an outgrowth of this popular resurrection of the vintage circuitry. Gaynes says that Moog designers and engineers wanted to avoid creating a semi-modular synth that would bog players down in complexity, which is why the synth's circuitry and module layout is simple, direct, and minimal. To that end, patch points are spread out across the Grandmother, instead of concentrated on the right side of the panel as with the Mother-32 and DFAM. From left to right, the modules are: Arpeggiator/Sequencer, Modulation, Oscillators, Mixer, Utilities, Filter, Envelope, Spring Reverb, and Output. Nothing about this signal flow, even when experimenting with the patching of modules, is confusing or daunting. As Gaynes explains, Oscillators 1 and 2 and Noise are normalled into the mixer. From there, the signal flows into the Filter, then the VCA, Reverb, Wet/Dry crossfader, and Output. "The simplicity of it, and the directness of the way the controls are laid out, and the way the pre-patched signal flow is set up, it has a really wide sweet spot," says Gaynes. "And almost every sound that you dial-in is going to be rewarding. The experience of an instrument that is really musically satisfying is a combination of really good sonics and a really focused user interface that trims the fat and just leaves really good stuff that is going to give amazing results." One of the ways that players can add more complexity to their sound with patching is by using the Grandmother's Utilities module. As Gaynes explains, this module isn't pre-patched into the synthesizer's signal flow. Players have to patch it with different modules to use its modulation capabilities. To fine-tune a signal, for instance, Gaynes says one can use the attenuator module in Utilities. This module also has a high-pass filter that Gaynes describes as an "extra shaping module" that works equally well on control voltages and audio. The Utilities module also does band pass filters, and Gaynes likes to use it for percussion synthesis. If he is trying to do hi-hats, for instance, Gaynes takes the Noise from the Mixer module and patches it through Utilities' High Pass Filter to remove the low-end of the noise and be left with a "crispy high-end sound." "There are lots of tricks like that with the Utilities module if you want to be sophisticated," he says. "But it's out of the way if you don't need it." Which, in a sense, is what the Grandmother is all about. Functions are there if you need them, but can easily be put in the background if you want to keep things simple. The Grandmother also features an Arpeggiator and Sequencer module, which can be used in standalone mode for the Grandmother itself, or in combination with other gear. Our "Monophonic vs. Polyphonic Synthesizers: Which is Right For You?" video, featuring the Moog Grandmother. "You can patch the Pitch and Accent voltages from the sequencer to other modules for complex and expressive rhythmic sequences," says Gaynes. "For example, the sequenced pitch to the Rate input of the Modulation oscillator for three-oscillator patches, or sequenced FM sounds, or the Accent output to the filter cutoff input for funky, bouncy acid lines." Players can also use the Grandmother's sequencer to synchronize new old and new gear alike by setting independent clock resolutions (in "pulses per quarter note" or PPQN) for the Grandmother's analog clock input and clock output. So the Grandmother could, for instance, be synced to MIDI clock from a DAW or a modern drum machine, Gaynes explains, with the synth's analogue clock output producing one pulse per step, or two pulses, or three, all the way up to 48 PPQN. The Grandmother easily patches into other modular rigs, including Moog's own Mother-32 and DFAM or the wide spread of Eurorack modules available. "There was a strong focus on making sure it was a totally satisfying and wonderful experience on its own," says Gaynes. "But it is truly modular in the sense that each individual modular element can be used completely on its own." "So is it going to be the Moog signal chain?" he adds. "That is completely up to you." For example, one could decide to just use the Grandmother's VCA module in a signal chain that includes an oscillator and filter from other non-Moog modules. Players can also control audio from another Eurorack module by pressing the Grandmother's keys or using its sequencer or arpeggiator, but also simultaneously use the synth's filter and modulation capabilities. "You're able to use those modules completely independently or in combination with each other, just as your own concepts of sound design lead you to explore," says Gaynes. "So basically it's a fully integrated and playable synthesizer but can behave like independent modules whenever you want it to."